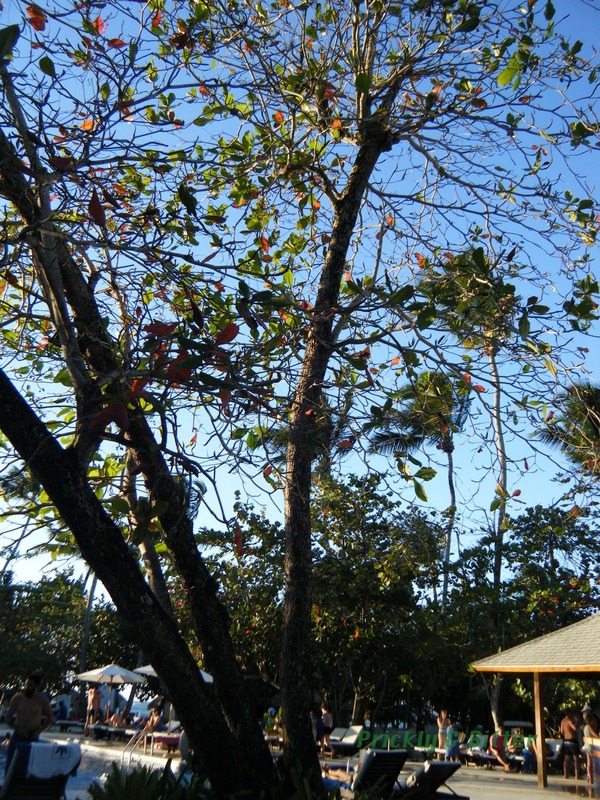 The tropical almond is a very large tree, reaching heights up to 35 meters tall, native to the warm tropical regions in Asia, Africa and Australia. This particular species (that common name applies to 6 or 7 species in the genus; one of the reasons why I'm not a big fan of common names) is native to India and surrounding area, reaching as far east as China and Thailand. It is planted extensively throughout the New World Tropics (the Caribbean Islands, and Central and South America) as an ornamental species. It was discovered that the seeds of the tree are edible once the very tough outer husk is removed from the fruit, and when this husk is added to fermenting sugar cane an amaretto-like beverage can be produced (and hence the name "tropical almond," not just for the appearance of the fruit which are pointed to by the pink arrow in the third photo). 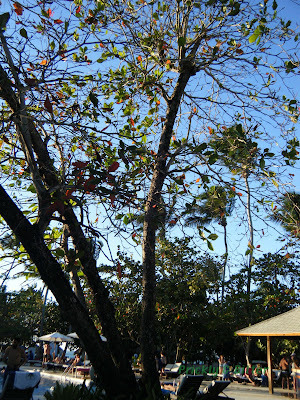 I have seen this tree on every single one of my tropical vacations; I'm pretty sure I've even seen it planted in Florida. Normally to see an ornamental tree or shrub species everywhere isn't uncommon, since if it's pretty in one area it's likely going to be pretty in another area. But to introduce a species that sheds its leaves during the peak tourist season, as well as its fruits that often attack unsuspecting tourists, is just plain silly to me. 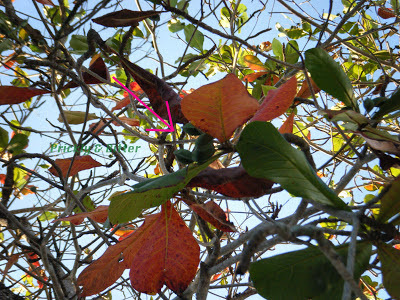 You've got all of these thousands of species of native trees to tropical North and South America that keep their leaves all year round; why not use one of those?! For the entire week there were people pulling leaves out of the pool, since during the summer months this is a wonderful shade tree and so logically is planted in areas where shade is desirable. Medicinally, this plant has been very popular in native herbal medicines around the world for a wide range of treatments: it has reported use in India and Suriname for dysentery and diarrhea, and in Taiwan for liver disease. Interestingly, this plant has gotten a lot of press recently because of the reported benefits it might have in fighting cancer. There are some chemicals in the leaves that reportedly act as antioxidants, but there have been no studies that have shown that this plant has any effect on cancer cells, either in the body or in petri dishes (from any species!). Should someone "prescribe" this plant to someone who has cancer or suggest they drink a tea prepared from the leaves it is highly unlikely to result in death, but don't expect it to melt the cancer cells out of the body. So far it's a fake cancer cure at best. It does have some proven health benefits, but only for a very narrow portion of the world's population. 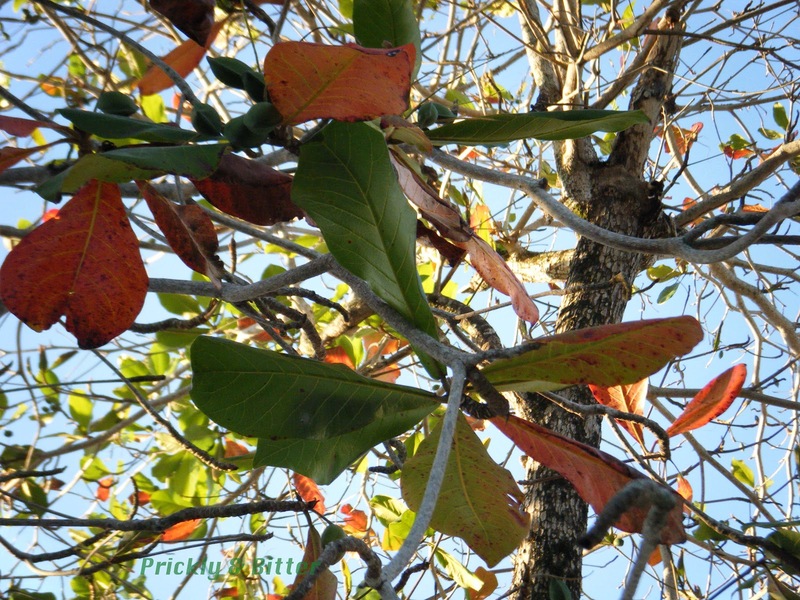 In a study that examined bark extract from this tree they noted that it has the ability to kill the plasmodium that causes malaria, even when this plasmodium displays resistance to all (or many) of the drugs we currently use to treat or prevent malaria. This is a very promising result for those who are diagnosed with (and who die from) multi-drug resistant malaria every year. For those of you who are fish enthusiasts, you have likely been in close contact with this plant and just didn't realize it. The leaves can remove toxins from water, especially heavy metals that might be contaminating the water. They are used to condition water before it is prepared for fish inhabitants in aquaria. Also, it has shown promising activity in preventing the spread of water molds that grow on fish (usually called "Ick"), effectively reducing disease in fish populations. If you've ever purchased a betta fish (sometimes called a "Siamese Fighting Fish" in pet stores), you've likely purchased a fish that was treated with these leaves as preventative measure to ensure it gets to you, the consumer, disease-free.